We first covered Pictarine way back in April 2011, a Web app that pulls in all your photos from various hosts, combining them into an organized, powerful image browser for you to access all your online photos. That’s great in itself, but what’s the real benefit here? Then last October, the Paris-based company rolled out support for a number of additional services, including the increasingly popular photo-sharing site 500px, online storage services Dropbox, PicPlz and Windows Live. That’s Pictarine in a nutshell. Now, however, the photo service has transcended its Web app roots and launched a native app for Android mobile devices. When you first launch the app, you’ll have to log-in either with your Facebook or Google credentials. You can then choose to follow the photos of your friends and contacts on Facebook, Twitter, Instagram, Flickr, and Tumblr. You’ll note there is also a ‘Playlists’ feature, which lets you organize your top snaps and share them across the social sphere. This can be a mix of your own photos, or ones shared by your friends. To add a snap to a playlist, you long press a thumbnail and select the playlist you wish to add it to. Now, if you’re more into managing your own photos than seeing your friends’, then you have the choice of an additional six services – Google, Dropbox, Windows Live, 500px, Photobucket and Shutterfly, which are accessible through the ‘My photos’ and ‘Surprise Me’ items in the main menu. When you view your own photos’ stream, you’ll see everything from the accounts you’ve integrated with and your camera roll. You can choose to just view the photos stored on your device, if you wish, or select a specific host (Facebook, Twitter etc) to view your photos from there. If you’re not overly bothered about which photos you view, the ‘Surprise Me’ option reels in a random mix of your snaps from everywhere. 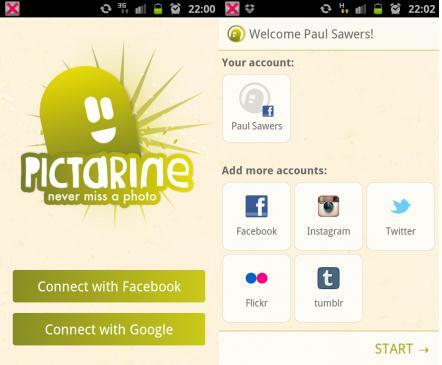 We were big fans of Pictarine’s initial Web-based incarnation, and now that it has landed on Android via a native app, well, we’re even bigger fans. The big question, of course, is when can we expect to see this land on Apple’s omnipresent mobile devices?